Open to everyone interested in this field, the EUA Council for Doctoral Education (EUA-CDE) invites university members and other stakeholders to take this opportunity to exchange good practices and build new relations with European policy makers, funding organisations and global partners. This event may be of particular interest for academic leaders, doctoral education professionals, doctoral candidates and other research stakeholders. 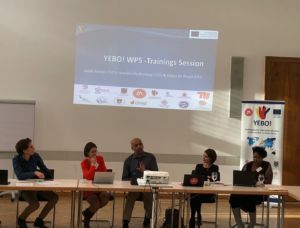 The YEBO side-event will last 1,45 hours and it will be held during the EUA-CDE pre-meeting (12 June 2019). 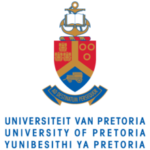 The topics will be: Overview of South African Doctoral Context (state of the art, National Strategy, current challenges); current opportunities in South Africa for European universities (co-tutelles framework; fellowships); future perspectives for the Internationalisation of Doctoral Education in South Africa (long-term strategy, new investments & objectives beyond 2020). 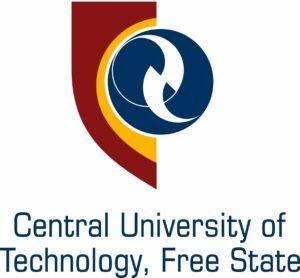 The Central University of Technology, Free State extends an invitation to service providers to tender for the “Call for tenders for purchasing a service providing access to a database of international funding opportunities for PhD candidates of European Project YEBO! South African partner institutions”. All bid documents (available in English only) are obtainable from 09:00 on Monday, 25 February 2019 until 10:00 on, Monday 25 March 2019, from Room 55 Orion Building or via e-mail): tenders@cut.ac.za. All of the 15 YEBO partner institutions met from the 27th to the 30 of November. They participated all together to see the results reached so far and to decide on the future activities of the project. The results from the first Training session in Bloemfontein. The progress report on the quality management of the project’s first year. The PhD Portal of the project. Clarification of the themes, targets and places for the next conferences and training sessions. Suggestion of a few modifications on the PhD Portal. Validation of the equipment selected by the partners institutions for their purchases. Validation of the dissemination plan of the project. YEBO ! partners from Europe and South Africa met in Bloemfontein from the 23rd to 26th October to deliver a series of Workshops on Intercultural Competencies.During the training session on Intercultural Competencies the participants were involved in the workshop on Introduction to the need and impact of having Intercultural Competencies and the workshop Testimonies and exchange of best practices on Intercultural Competencies. Keynote speakers during the training were: Liezel Frick, Fanny Poujol and Stephanie Giljohann. This training session on Intercultural Competencies was the first one in a series of four. The other sessions will be organized in the course of 2019 and 2020, focusing on the set-up and management of doctoral schools, international supervision and research capacity. 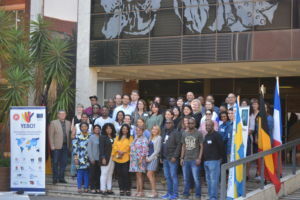 It took place on the 12th and 13th April in Cape Peninsula University of Technology. Fourteen partners attended it. During this meeting several subjects were tackled. First the results from the internationalization rate questionnaire were presented and helped set the priorities of this project. Discussion on the PhD portal and how it should be organized took place. And finally the theme, approximate date and place of the training sessions and conference were decided. The meeting took place at the Education, Culture, and Audiovisual Executive Agency (EACEA) headquarters on the 29th and 30th January 2018. It provided opportunities for networking and sharing knowledge on how to conduct an Erasmus+ programme. Two representatives of the project went there, Camylle Pernelle (UM) and Leolyn Jackson (CUT). They met with the project officer in charge of the project. They got the chance to discuss the regulations concerning Erasmus+ Capacity Building projects. The Kick-Off of the project took place the 4th and 5th December 2017 in Montpellier. 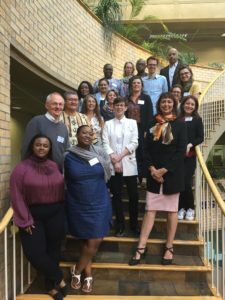 It gathered around thirty participants from the fifteen international partners involved in the project. This Kick-Off was a very important meeting where partners got the chance to meet one another. It also allowed the outlining of the implementation of the activities, goals and the guidelines to be adopted during this project. During these two days, the participants discussed how to evaluate the internationalization rate of PhD studies among all partners, the creation of a PhD portal and the organization of conferences and training sessions. Kick-off Meeting in Monptellier (FR). 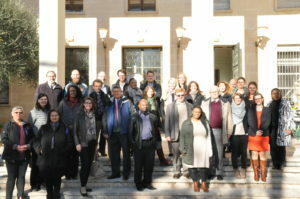 Meeting 1 in Cape Peninsula University of Technology (SA). Introduction of the results from the comparative analysis of the internationalization indicators. Mid-term meeting hosted by the Technische Universität Berlin (DE).